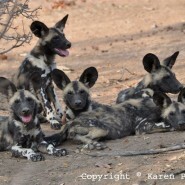 Karen and her two volunteers Chris and Neve Wade visit Dr Rosemary Groom of the Lowveld Wild Dog Project. 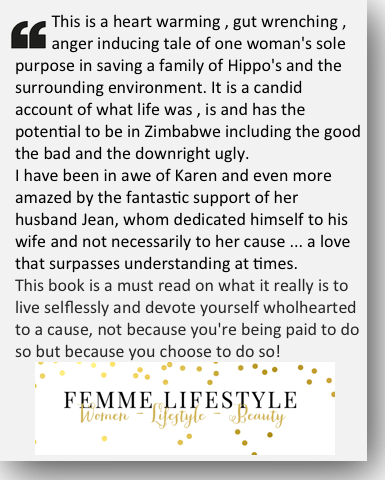 Read the full review from Femme LifeStyle blog. 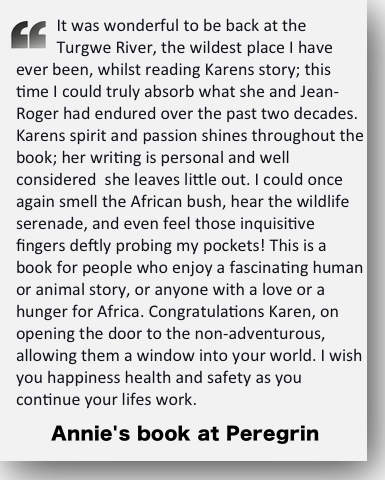 The book can now be purchased on line Internationally at www.kalahari.com or with a personal dedication on my website. Full review on Se7en's site. Full review from Bush-bound girl at bush-bound Girl website . 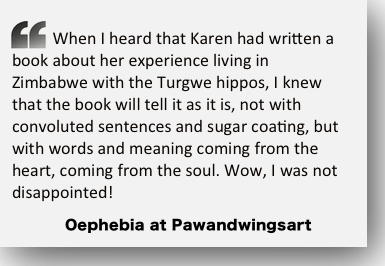 Turgwe Hippo Trust believes in Sarah Carter's vision of loving animals and the new Twala Trust Animal Sanctuary of Zimbabwe. Moonlight and a Turgwe River Pool July 2018. Win a Second Chance of a Piece of Patrick Mavros Amazing Work. Win a Chance of a Piece of Patrick Mavros Amazing Work. The End of 2016 and a Flooding Turgwe River, bring on the Rains! New Calendar for 2017 is unfortunatelly SoldOut ! It's a Boy, Welcome to George ! 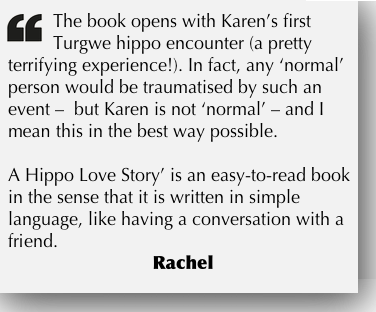 A HIPPO LOVE STORY- Karen Paolillo's book launch June 14th 2014 Harare Zimbabwe. 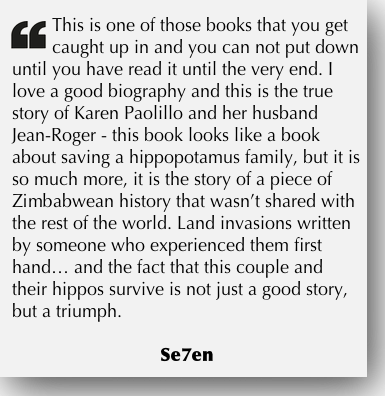 A Hippo Love Story by Karen Paolillo published by Penguin Books South Africa. Tough time for a croc ! Feb. 16th - The first baby hippo of 2014. What happened during Year 2013? Volunteer : Cary Martin of UK, November 2007. 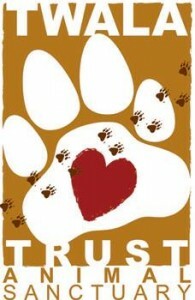 Support us on the Net, adopt our banner. 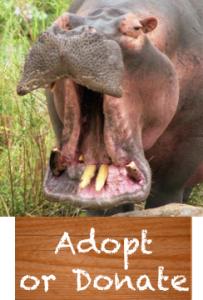 On your FaceBook wall, on your blog or in your website, insert our support banner with a link to [www.savethehippos.info]. Banner size is 750x90 pixels and available with a transparent or beige background. Feel free to download the zipped file.